If you’ve been following me for a while, you might already know that I received the entire Sugar Pie Vapes range. The video made its way to the YouTube channel, and four of the reviews are live on the website. It’s time for the fifth and final review from the range — the Sugar Pie Vapes Sweet Apple Pie eliquid review. And, can I just say, I’m actually super sad that this is the last flavour that I get to tell you about. This range has been out of this world amazing, with unique and interesting flavours that are truly delightful to vape. I won’t talk too much more about them here, as I have gone into a lot more detail in the previous Sugar Pie Vapes, but I have linked (in red) the individual reviews above if you want to have a look. Without any further ado, let’s jump right in, shall we? To get things out the way nice and early, I vaped this juice the most in my Innokin Scion tank + 0.5-ohm coil, at 81 watts. That was my favourite combo for a while, but it would appear that I’ve branched out a little … I’ll tell you all about that another time. This one really does smell like a little slice of apple pie heaven. I just grabbed the bottle, unscrewed the cap, and took a deep inhale. The smell … Well, that’s actually a little disappointing. I know I’m giving away some of the ending a bit here, but this one tastes a lot better and stronger than it smells. I actually didn’t hope for much when I first poured it into the tank — the smell is *that* muted. Never judge a book by its cover … or a liquid by its smell. I can smell the apples. They smell like proper cooking apples, the Bramley apple kind that my Nan used to use when she made proper apple crumble. There’s some sweetness in there too. Imagine sticking your head over the saucepan as the apples are bubbling away in sugar inside it. A muted version of that is exactly what I think this little delight smells like, with just a pinch of pastry. It’s there. The individual flavours listed in the ingredients are: apple, cinnamon, meringue, and other. Considering this smells pretty weak in my opinion, Sugar Pie Vapes Sweet Apple Pie is PACKED with flavour. In fact, I was in no way prepared for it. I expected the taste to be as weak as the smell, and that’s absolutely not the case. How odd. Have you ever had a McDonald’s apple pie? Seriously though; this juice is a really good one. Not too sweet or sour, with a real hearty apple burst, it’s not the most flavour-packed one of the Sugar Pie Vapes bunch, but it definitely manages to hold its own. The inhale brings in the sweet apple, with the pastry addition peeking through on the exhale. There’s a really good blend of everything in this well-rounded eliquid. Not too much of one flavour or the other, but a really great mix of the two. The apple flavour is really realistic, I think. There are some spices in there — a touch of cinnamon, perhaps a bit o’ nutmeg too. It actually tastes like apple pie. I know it’s meant to, but you could almost be eating an apple pie, that’s how good it is. I overlooked this flavour a little at first. It’s one that I tried and kinda forgot about, went back to and then became a little obsessed with it. It’s warming and hearty, I love it. I used Sugar Pie Vapes Sweet Apple Pie in a number of devices, ranging from those well-known for great flavour to those tanks that are a bit … well, pants. (Not that I’m being blunt or anything.) The flavour across *all* devices was amazing. Even on tanks that I feel aren’t that great for true taste, this juice was bloomin’ delightful. Sweet Apple Pie by Sugar Pie Vapes has a really smooth finish to it, just enough of a kick to satisfy your cravings, without so much that it’s overpowering. I tried a similar juice from Purity — Twisted Turnover — and I found it to be a bit scratchy on the throat. (You’ll find the video for that one here: Purity Eliquid Review) This one is so much smoother and more pleasant to vape. The entire range is delightfully smooth. Sweet Apple Pie is the final written review for the range, and the results are in. This is a range worth trying. I haven’t found a Sugar Pie Vapes flavour that I haven’t enjoyed, and you know what I get like — I’ve always gotta find something to moan about. Not with Sweet Apple Pie though, and, with the exception of wanting a bit more taste in one of them (Hazelnut Cookie), they’ve always left me wanting more and more. Just in case you were wondering, my favourite vape device combo for Sugar Pie Vapes Sweet Apple Pie was the Jac Vapour Series-S22 tank (0.5-ohm coil Series-S DTL coil) + Jac Vapour Series-B DNA 75W box @ 30-35W. Would I buy Sugar Pie Vapes Sweet Apple Pie again? Absolutely! I think it makes a wonderfully refreshing change to come across an old flavour with a slightly new twist, and this is one is fabulously spot on! Would I recommend Sugar Pie Vapes Sweet Apple Pie to you? If you’ve ever lusted after a McDonald’s apple pie, I predict you’re going to adore this eliquid flavour. Fruity, sweet, and with plenty of crumbliness pastry … It’s the best apple pie flavour I’ve had so far. 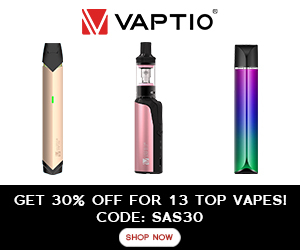 You can save 10% on everything at TABlites.com using my exclusive discount code: BESTECIG. This includes Sugar Pie Vapes eliquids! HONESTY POLICY: These Sugar Pie Vapes eliquids were sent to me by TABLites. I did not pay for these products. I was not paid for my review, and I will not be paid for my review. All opinions are mine and in no way influenced by the brand/manufacturer.